As part of my therapeutic Mother-Yourself Day weekend, I decided to buy two Mother’s Day cards: one for myself, and one for the woman that gave birth to me. I know that woman doesn’t deserve a card. Don’t worry – I’m not sending it to her. I wanted to get the card so I could write the things I wanted to say to her but never could. Finding an appropriate card was near impossible. They don’t make Mother’s Day cards for horrible, undeserving mothers (though really, why can’t someone do this). I must have picked up at least 50 cards. Honestly, it made me a little sad, because I realized so much of what I missed out on by not having a good mother. 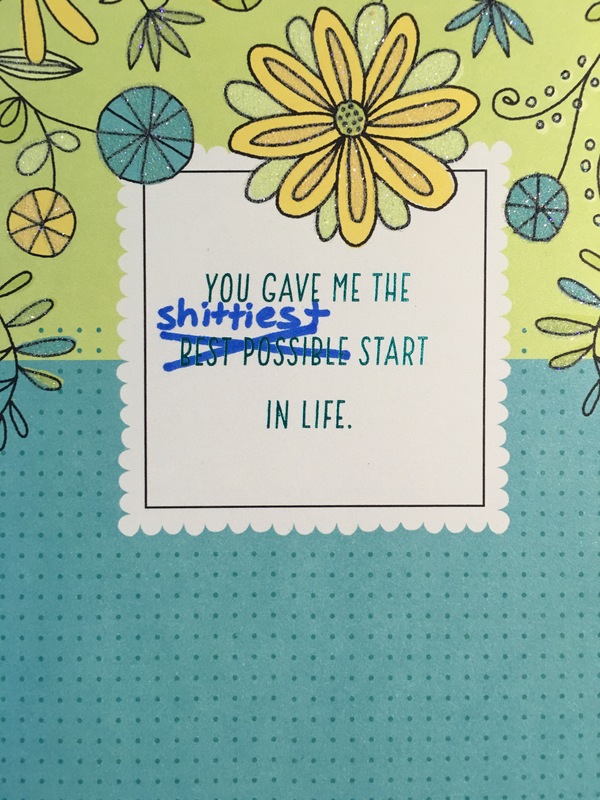 Finally, I came across a card that was definitely not true, but something I could easily edit to make it appropriate. I sat at my desk last night, opened the card, and started writing. I could have written so much more, but I couldn’t fit any more words on the card. I almost wish she could see what I wrote. I wish she could know how I feel. But even if she did, it wouldn’t matter. And I have to accept that. I guess, by some definitions, you are my mother. But you don’t deserve that title. Being a mother is more than just giving birth. It’s about loving, caring for, guiding, and nurturing your children. You never did that. Ever. You pretended to love your children in public view, so everyone could think you were a good mom. But you weren’t. You don’t know how to love anyone but yourself. You never cared for me. Even my most basic needs were always such a burden for you. You neglected me, physically and emotionally. You abused your own child, your own flesh and blood. You took away my childhood, and I can never get that back. You broke my heart. Why? I didn’t ask to be born. You didn’t need another child to torture. I don’t know what you saw in me that made you hate me so much. R got your love and attention (perhaps a little too much) because he followed your every command. He didn’t know any better. But I did. I knew you were wrong all along. It just took me 29 years to figure out how to stop you. I dealt with your torture for 29 years. I used to think something was wrong with me. Everyone else seemed to love their moms, and I never felt that connection. The only thing I could feel was fear. I lived in fear of you, my own mother. And no one could understand why, because you took us to Church every Sunday and you send us to private school and you took us shopping like any normal family would. You were the perfect mother. No one saw how evil you really were. You ruined my childhood. You ruined my adolescence. You ruined my 20s. You will not ruin my life anymore. Because despite everything you’ve done to me, I am still standing. I am still surviving. I’m not perfect. I’m still afraid of you. That’s how deeply you’ve affected my life. I still have nightmares. I still shake when I check the mail. I still have the memories. I’m still grieving your loss. But I am better without you. I don’t need a mother now. I needed one before and you chose to do what you did, you chose not to be a real mother. So I had to learn how to mother myself. I had to fill in the gaps that you have always left empty. I do have to thank you, though. I tell myself that going through hell has been for a greater purpose. I am not the weak, worthless person you wanted me to be. I am strong. I have worth greater than you will ever get to see. I am going to make a difference in the world – because of the hell you put me through. So thank you for forcing me to be a better human being. Thank you for showing me exactly how not to be. You are the worthless one. And you are no longer my mother.